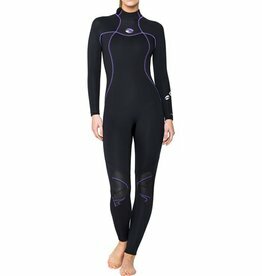 Designing a women's wetsuit to reflect their performance needs, make them look and feel great and inspire the spirit of adventure, was Bare's goal. To do this, they looked at wetsuit design differently, not from their eyes, but from eyes of the wearer. The Bare team of female designers gathered women of all ages and skill levels to create focus groups that empowered conversations to get to the heart of what women wanted functionally and aesthetically from their suits. Design inspiration was taken from trends outside the industry. Observations, thoughts and ideas were brought together and synthesized into a product that was designed around women. The result, the new Nixie series. Designed for performance as well as appearance, Nixie combines sleek, slimming lines and fashion-forward colors with some of Bare's latest trademark innovations. 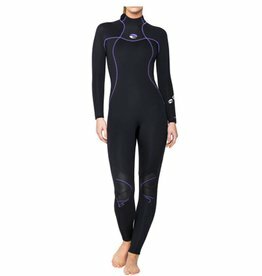 Inspired by sleek slimming design lines and offered in a variety of fashion forward colors, Nixie is a versatile wetsuit for use in all watersports activities that inspires confidence. Silky soft Full-Stretch neoprene with lines that flatter your curves. Suit is offered in fashion forward colors, has set-in sleeve design for comfort and flexibility, 19" (48.26 cm) long back zipper for easy on, easy off. Suit is made from S-Flex neoprene for extreme comfort and mobility, has Glide-Skin collar for maximum seal and reduced flushing, keeping you warm, and the Velcro adjustment collar with booklet-style cover to protect your suit from snags and pilling. Loop at the base of zipper to assist in getting into your suit and Armor Flex kneepads to protect against snares and abrasion. Rolled Glide-Skin on wrist and ankles reduce flushing of water at key seals and flat-lock stitched seam construction adds comfort and durability.